A counter may link to as many other counters as you like. A counter may only be linked-to by one other counter. You cannot create circular links between counters. This last point probably requires more detailed explanation. As an example, say you have three counters, "A", "B", and "C". If you have counter "A" set to increment counter "B", and counter "B" set to increment counter "C", you cannot have counter "C" incrementing counter "A". 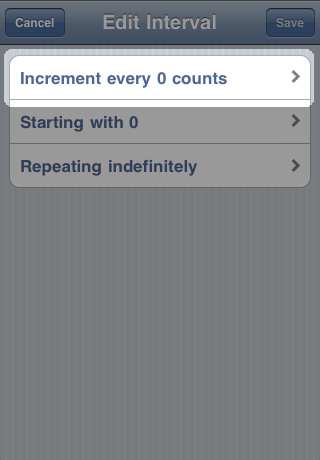 Having the three counters linked in such a way could lead to a situation where incrementing counter "A" would increment counter "B", which would in turn increment counter "C", which would itself increment counter "A" again, and so on forever. 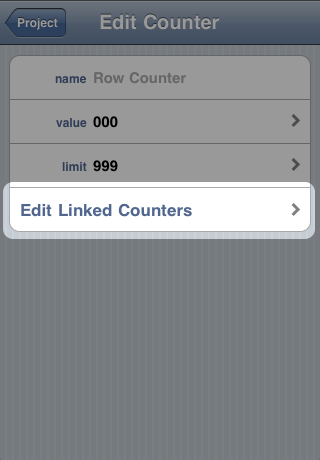 Linking counters together allows one counter to increment another automatically at certain values. For this example, we'll link the Row Counter to a Repeat Counter. Tap the "Edit" button. Tap "Link to Another Counter". Note that this will read "Edit Linked Counters" if the counter is already linked to another counter, and it will be disabled completely if you have only one counter in your project. The screen that appears shows the available options for periodic linked counters. 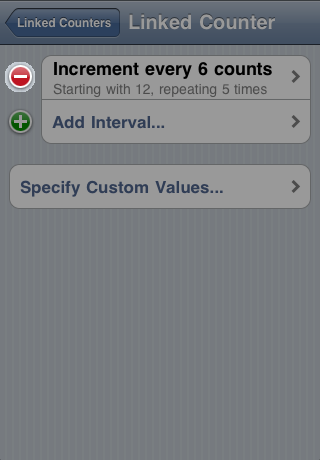 You must set the "Increment every" and the "Starting with" values before you can save a periodic linked counter. 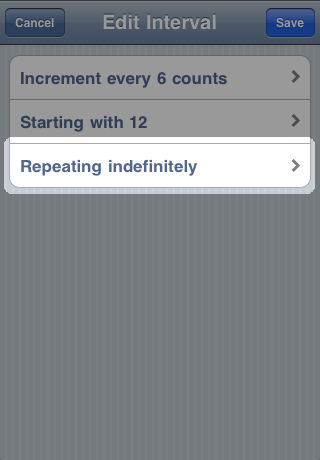 Setting the "Repeat" value is optional. 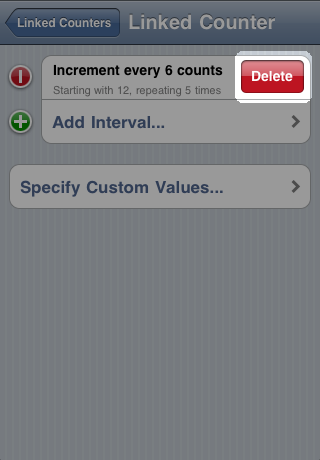 Linked counters without a repeat value will repeat indefinitely. 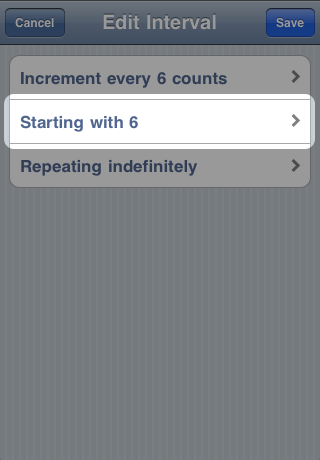 For this example we'll set the Repeat Counter to be incremented every 6 counts of the Row Counter, starting from 12, ending after 5 times. 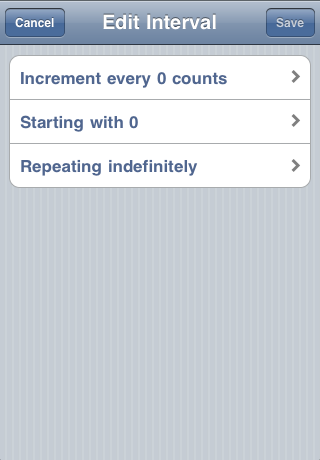 Tap "Increment every 0 counts". 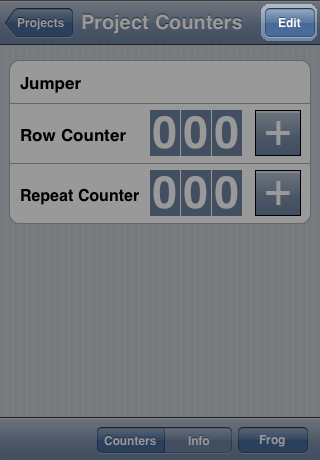 Note that Knit Counter will not allow you to create intervals that are beyond a counter's limits. 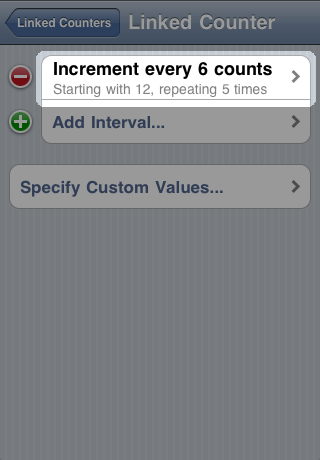 If you have a limit of 10 set on your counter, "increment every" and "starting value" must be 10 or less. Type 6, then tap "Save". 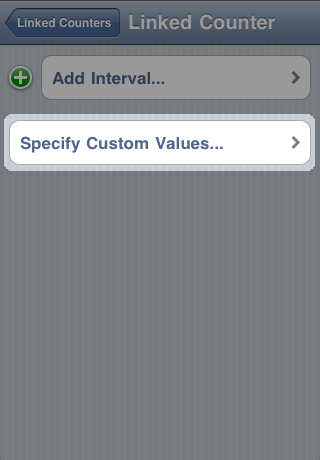 Note that the starting value has also been set to the value you just entered. 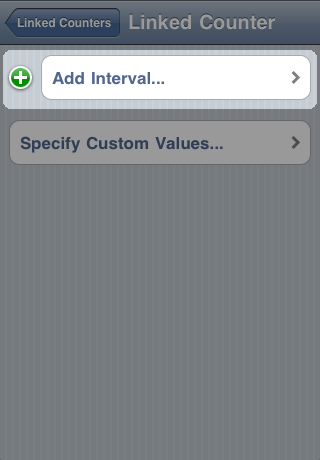 Whenever you set the interval value, the starting value is set as well. Tap "Starting from 6". 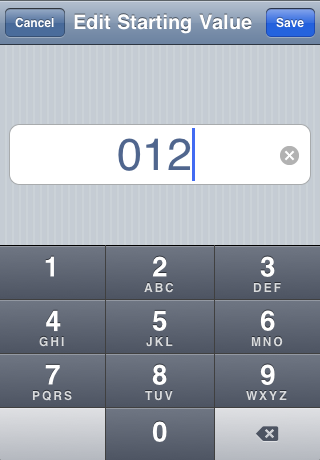 Type 12, then tap "Save". Type 5, then tap "Save". Tap "Save" to save the linked counter and return to the previous screen. The link you have just created will be displayed at the top of the screen. Tap "Linked Counters" to return to the previous screen. 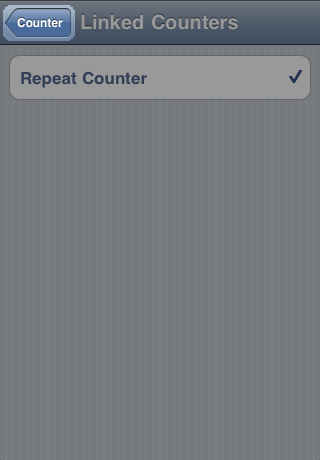 Note that "Repeat Counter" now has a tick next to it, to indicate that it is linked to. Tap "Counter" to return to the previous screen. Tap "Project" to return to the previous screen. 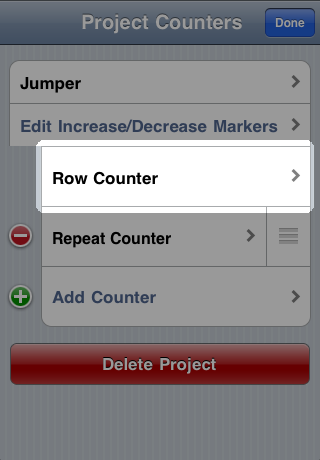 For this example, we'll remove the link between the Row Counter and Repeat Counter that we created in the previous example. Tap the "Edit" button. Tap "Edit Linked Counters". Note that this will read "Link to Another Counter" if the counter is not already linked to another counter, and it will be disabled completely if you have only one counter in your project. Tap the red delete button next to the link you want to remove. Tap the "Delete" button that appears on the right of the link. 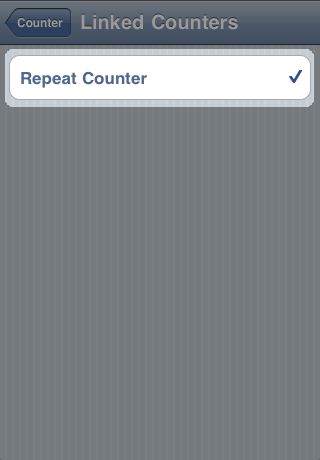 Note that "Repeat Counter" no longer has a tick next to it, to indicate that it is not linked to. Tap "Counter" to return to the previous screen. For this example, we'll link the Row Counter to an Increase Counter so that at the end of every 12th row, the Increase Counter is incremented. Enable edit mode by tapping the "Edit" button in the top right corner of the screen. Tap "Link to Another Counter". 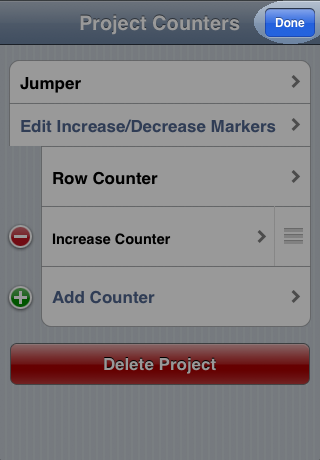 Note that this will read "Edit Linked Counters" if you have already linked this counter to another counter, and it will be disabled completely if you have only one counter in your project. You'll be presented with a numbered grid. 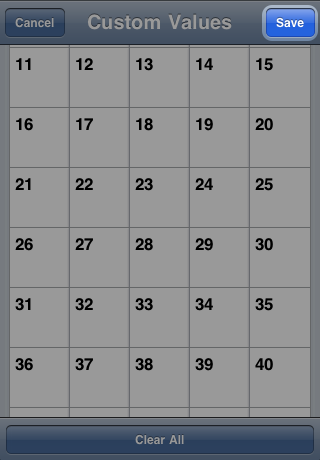 The squares in the grid correspond to the values of the Row Counter. 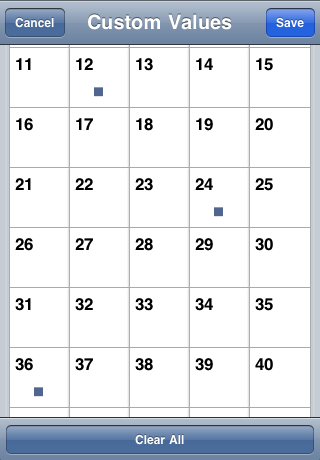 We want the Increase Counter to increment after every 12th row so just tap all the squares that are multiples of 12. 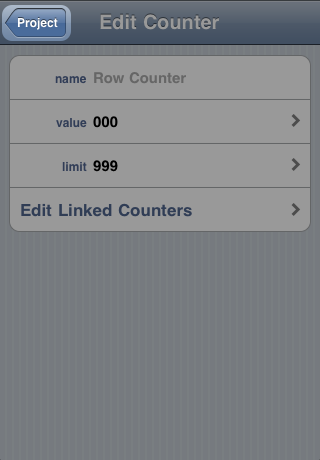 Note that Knit Counter will not allow you to create links that are beyond a counter's limits. 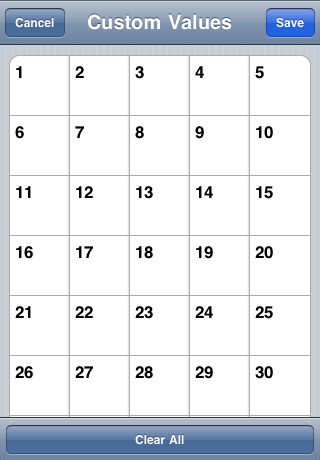 If you have a limit of 10 set on your counter, all of the grid squares above 10 will be disabled. 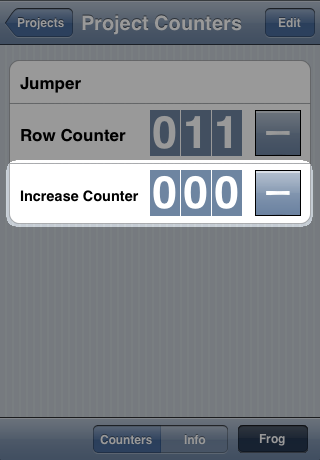 A blue dot inside a grid square indicates that the linked counter (the Increase Counter in this case) will be incremented when the linking counter (the Row Counter in this case) reaches that value. Tapping a square containing a blue dot will stop the linked counter from being incremented for that value. 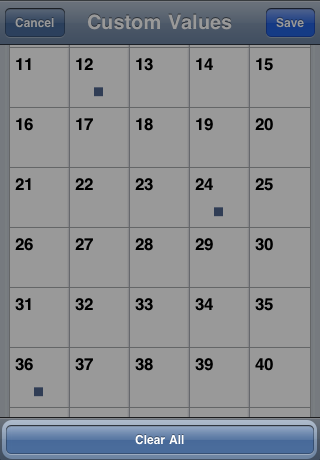 Note that blue dots will appear for any periodic links you've created. These dots can only be removed by removing the corresponding periodic link, they cannot be removed from within the custom values editor. 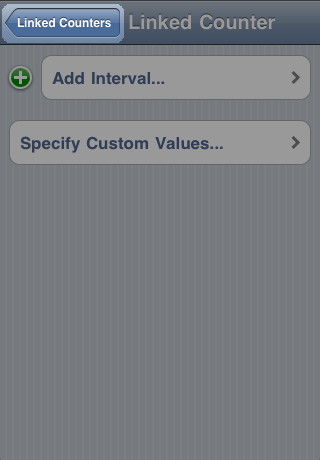 Tap "Save" when you're done to save the changes and enable the link between counters. 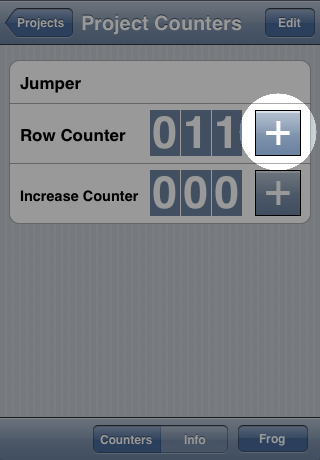 The Increase Counter now displays a checkmark next to it to indicate that it is linked to by the Row Counter. Tap "Counter" to return to the previous screen. Tap "Done" to exit edit mode. 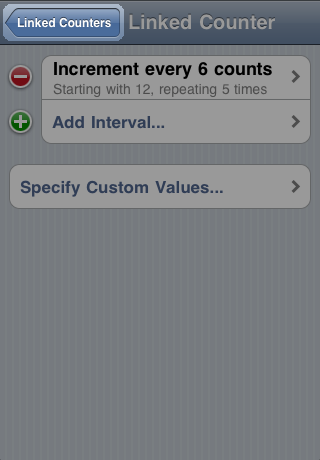 Increment the Row Counter as normal by tapping its "+" button. 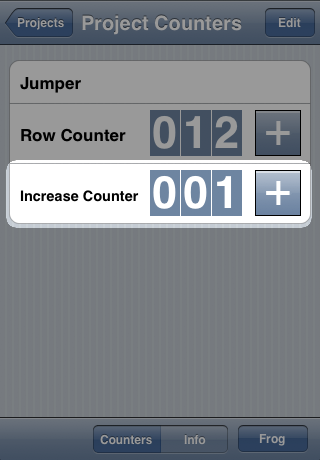 When the Row Counter reaches multiples of 12 the Increase Counter increments automatically. It's also worth mentioning that if you make a mistake in your knitting whilst using linked counters, everything works as you'd expect it to. When frogging, linked counters simply work in reverse. 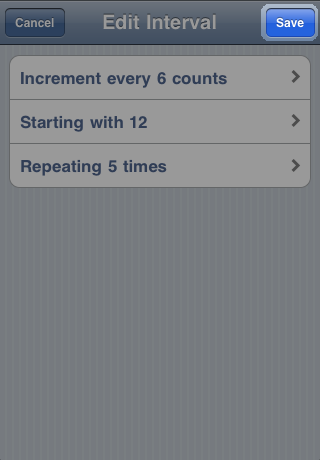 If you frog a single row, taking the Row Counter back to 11, the Increase Counter decrements by 1. For this example, we'll remove the link from the previous example so that the Row Counter no longer increments the Increase Counter. Enable edit mode by tapping the "Edit" button in the top right corner of the screen. Tap "Edit Linked Counters". Note that this will read "Link to Another Counter" if you haven't already linked this counter to another counter, and it will be disabled completely if you have only one counter in your project. 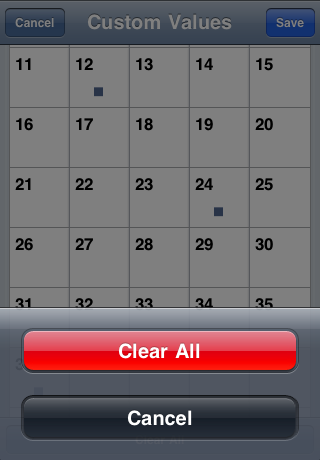 Tap "Clear All" to confirm that you want to clear all of the links. Tap "Save" to save the changes. Note that the Increase Counter no longer displays a checkmark next to it. Tap "Counter" to return to the previous screen. 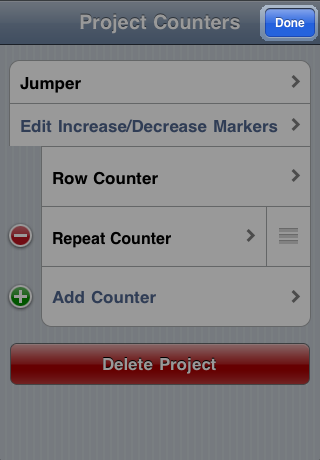 Using the navigation buttons in the top left corner of the screen, navigate back to the project counters view and tap "Done" to exit edit mode. The Increase Counter will no longer be incremented by the Row Counter.